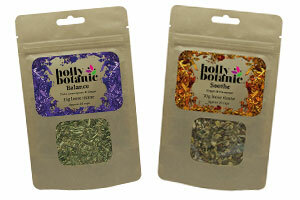 Everything created by Holly Botanic’s fair hand is 100% natural. This means she will never use any genetically modified ingredients and ensures all her products are cruelty-free; just as Mother Nature herself would insist upon. Her award-winning and delicious tisanes also happen to be very, very good for you. The health benefits are not a coincidence as the herbal infusions are meticulously researched and tested to ensure they do exactly as they say on the distinctively colourful packaging. Seven tisane blends for health and wellbeing range from Balance – an anti-stress tisane – through to Soothe for sore throats. Forever creating the next wellbeing option for her fast-growing legion of admirers and followers, the Holly Botanic product range is constantly expanding and now includes balms and scrubs for lips and feet. Moisturising, soothing and a pleasure to apply, the beneficial effects of the uniquely combined ingredients in the Holly Botanic balms enhance and protect the lips of women and men. 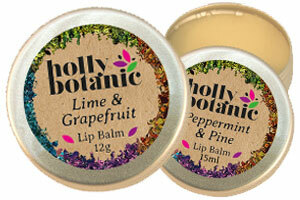 Whether you favour a zesty or earthy feel and aroma, the lip balms are big seller for Holly Botanic and with good reason. 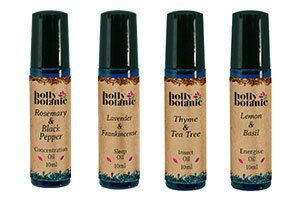 Among the most popular products from Holly Botanic are the aromatic oil blends created for specific health needs. For anyone struggling to sleep, try the Sleep Pulse Point Oil that combines exacting herbal ingredients to induce a good and peaceful night’s sleep. Or perhaps you are someone who needs to concentrate and focus at certain times. For you, the Holly Botanic Concentration Pulse Point Oil could stimulate focus and memory recall just when you need it. Pulse Points Oils can be applied on various pulse points, these include neck, chest, wrists, inner elbows, back of the knees and ankles. Given Holly Botanic has been recognised with the Taste Of The West Gold Award in addition to a Highly Commended Award, it stands to reason the world is beginning to take notice of the unique products created at HB HQ. Mother Nature would certainly approve. This entry was posted in Featured, News and tagged Health Products. Bookmark the permalink.